Winner for This to That Challenge #10 and More News! Thank you all so much for participating in our last challenge! We have a winner for the This to That Challenge #10. Shelly you are the lucky winner of the twine from our sponsor at The Twinery. Shelly please email me @ cevans@thedigibistro.com with your addy! Now for a little news! We will be taking a small break from the This to That Challenges. I'm in the process of revamping the new blog over at The Digi Bistro! So, we will be moving soon! Stay tuned for additional news on that! Have a wonderful day everyone! 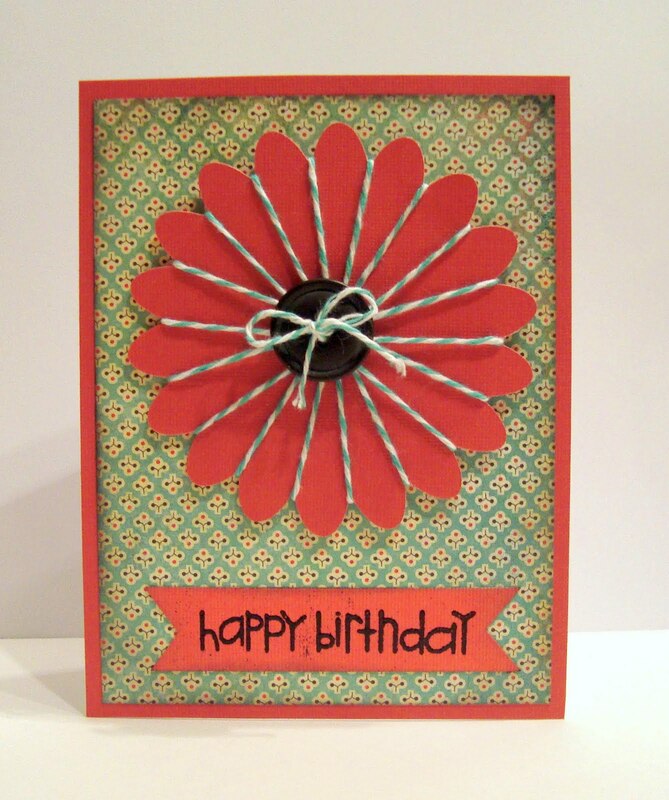 Blog Hop and Challenge Winners!!! This is just a quick post on winners here on my blog! All winners need to contact me by Friday Oct 28th to claim your prizes. Blog Hop Winner - Fang-tastic Blog Hop Oct 7th - 10th (Dena Jones). Dena you have until Friday Oct 28th to contact me for your prize! Challenge #7 - Winner (Kacee McVic). Kacee you have until Friday Oct 28th to contact me. Challenge #9 - Winner (Margo). Maida you have until Friday Oct 28th to contact me. 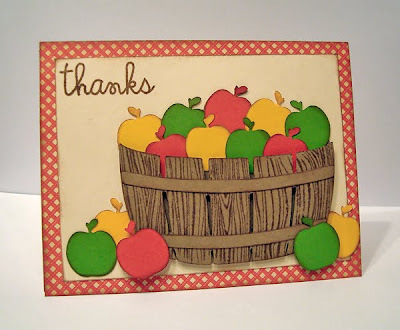 This to That Challenge #10 and Blog Winners! I have contacted many of you about winning but if I haven't gotten the prize out to you, please shoot me an email at cevans@thedigibistro.com with your address! I have check all of my post and will be putting all prizes that are to be mailed in the mail TODAY! With that being said, we will have a few changes for the following challenges. Our challenges will only be twice per month on every other Tuesday(bi-weekly) starting in November! However, I'm hoping everyone will stay active in posting your comments. I would love to hear more from you all! On to Challenge #10! This week's challenge is sponsored by The Twinery! Love, love, the colors of their twine. Thanks so much Nicole for sponsoring The Digi Bistro! Our prize for this week is from our sponsor Nicole - The Twinery. Go ahead and link up your card. You must use twine on your card. Can't wait to see what everyone come up with! Thanks so much for playing along! Happy Sunday everyone! 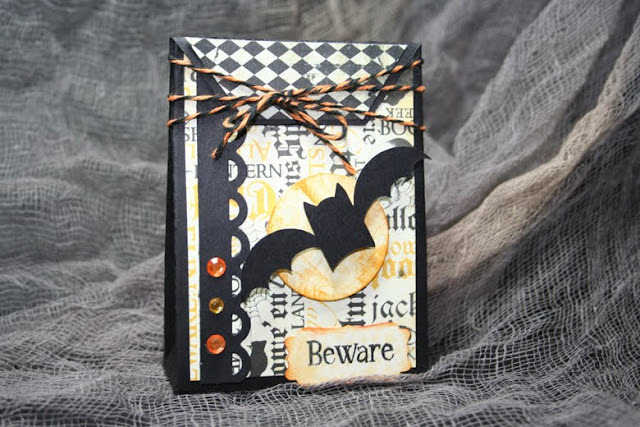 Welcome back to Day 2 of the Halloween Blog Hop hosted by Angel Urell! We will be hopping from October 15th thru October 17th! Very happy to be in this hop with all the other ladies this weekend! If you're coming over from Ruthie's blog then you are on the mark! If not go back and start with Angela! 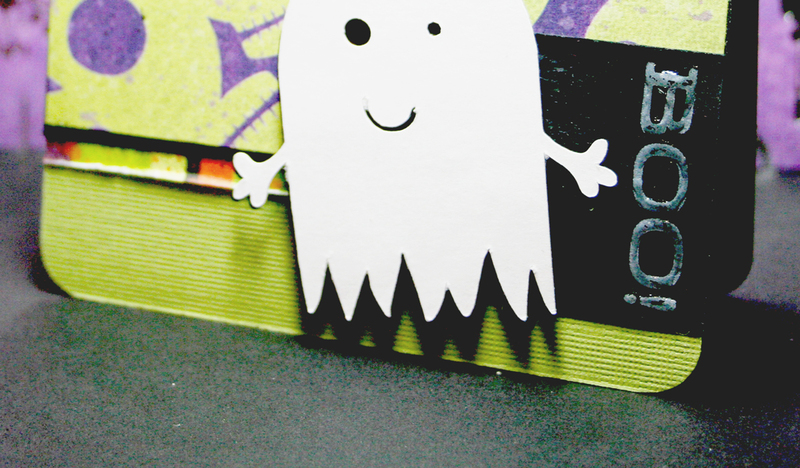 For my second project and for Day 2, I used The Digi Bistro - Pick Your Poison SVG Collection to cut out this little ghost. The BOO sentiment is from a stamp set and I have no clue where or who it is from. The paper is a couple of years old and I'm not sure who makes it. 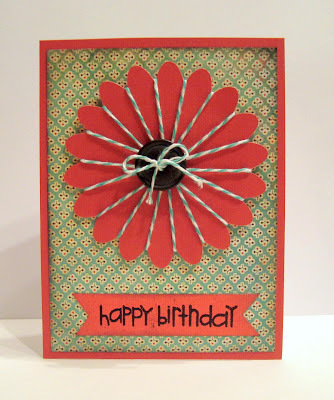 I used green card-stock as my base and some striped paper with a strip of the skull paper and black card stock. I rounded the corners using a corner rounder and TA DAAA! you have a cute little ghost card! 1. FIRST you MUST become a follower of this blog and leave a comment on this post telling me what you think of my creation. 2. To get a SECOND chance to win, head over to Facebook and "LIKE" The Digi Bistro FB page. Don't forget to leave a comment THERE for two entries per day to win! Just let me know you liked The Digi Bistro! I will announce my winner at the end of the week on the following Saturday morning. Don't forget to stop by to see if you are a winner. Now hop on over to Ashley's blog! See you on Day 3! Good morning Crafty Scrappers, I hope everyone is having a wonderful day! 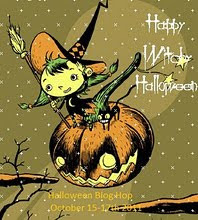 Welcome to another wonderful Halloween Blog Hop hosted by the very kind and sweet Angela Urell. We will be hopping from October 15th thru October 17th! I'm so excited to have joined such a group of fabulous and creative women this weekend to show off our creativeness! If you're coming over from Ruthie's blog then you are on the mark! If not go back and start with Angela! Here's the line up for this Hop! I only made two projects for this hop so I wanted to start off with something I made last month that many of you haven't seen, already! If you have seen this curious cat already, you still can enter this hop and win! 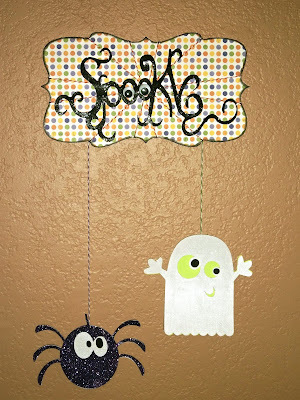 Here's my take of a Halloween tag! 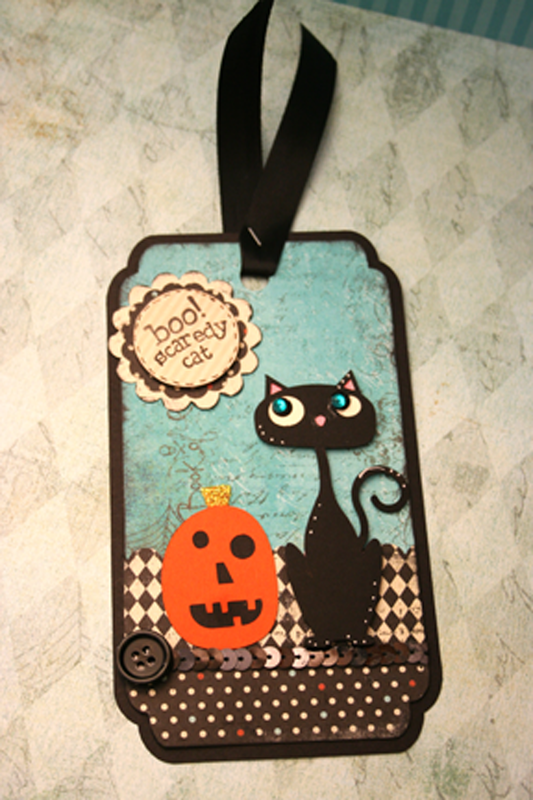 I used The Digi Bistro - Pick Your Poison SVG Collection and the Tag It SVG set. I wanted to make the cat look curious because he heard a bump in the night! He he, because he is a scared the pumpkin is laughing at him! You get it! I will announce my winner at the end of the week on the following Saturday morning. Be sure to stop by to see if you are a winner. Now hop on over to Ashley's blog! See you on Day 2! Happy Tuesday my crafty friends! Welcome back for another This to That Tuesday Challenge! Let me first start off by introducing to you our newest Designer on The Digi Bistro Design Team. Let's welcome Monica Flores. I have to tell you Monica is so creative. Head over and check out Monica's blog to find out what she's all about and show her much love! Next to announce our last week "This to That Tuesday Challenge - Winner." We had only two entries last week so this one was pretty easy. I used random.org to pick my winner! Krista you won this week! Congratulations to you! I say you definitely deserve to win. You have been with us in the challenges since Day 1. Thank you so much for playing along with us! Email me at cevans@thedigibistro.com for your $10 Gift Certificate to The Digi Bistro Store! Moving on to our challenge. 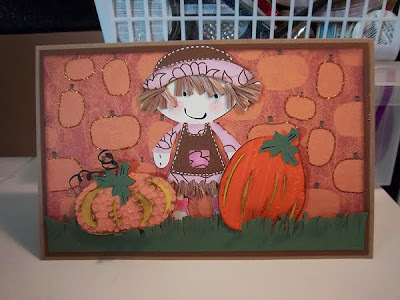 This week's is ll about Fall. I truly adore the colors of red, orange, and yellow trees with a hint of green. Fall is what you think of it. What are your favorite colors during the fall season? 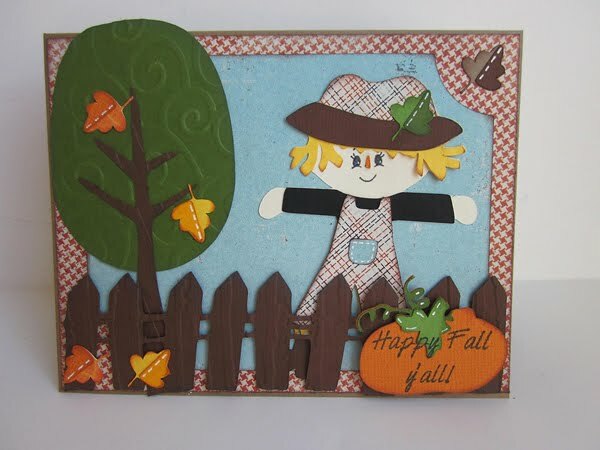 So therefore, this challenge is to make a card, box, or any type of crafty project with your favorite Fall colors. 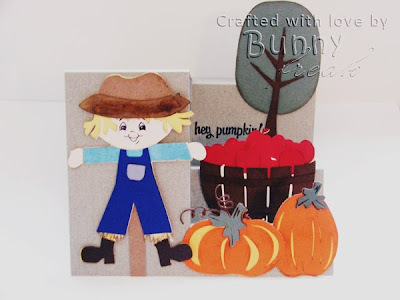 Here's what a few of our Designers came up with using sneak peeks from our Autumn Harvest SVG Collection. You'll be able to grab this Fall Collection on Friday! Come play along with us in our Fall color challenge. 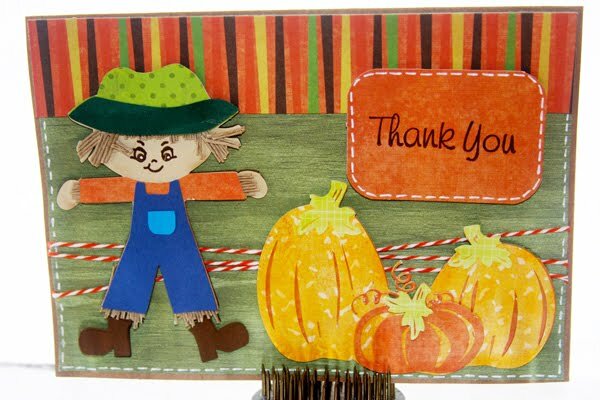 You can use any cutting files you have on hand as long as they are of Fall. 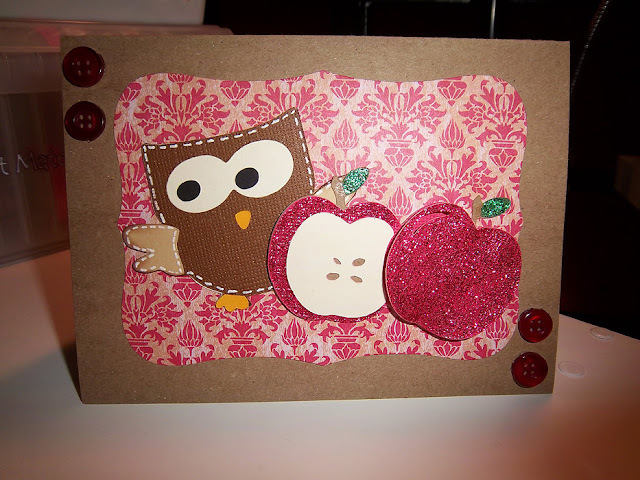 Feel free to use your stamps, stickers or other embellishments you have on hand to make your project. Next link up here for your chance to win a $5 gift Certificate to The Digi Bistro Store and the Trick or Treat clear stamp set by Inkadinkado! My third project for this hop is a little treat box. I used the little bat from The Digi Bistro's - Pick Your Poison SVG Collection. 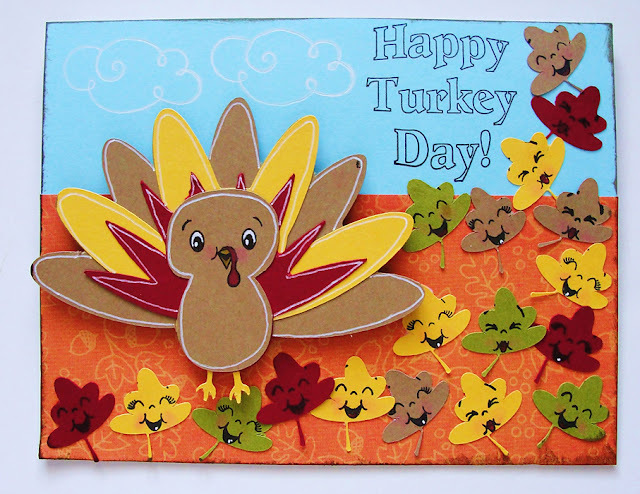 The papers are from Die Cuts With a View, one of my favorite paper companies! 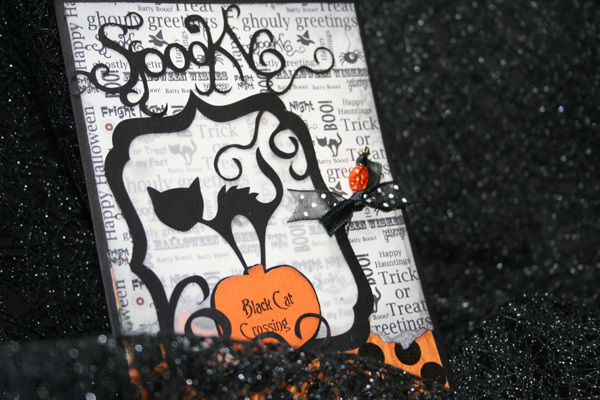 My little box is cut in black paper and embellished with DCWV - Ghost & Goblins paper stack. I inked the edges of the moon behind the little Bat and added a little touch of bling on the black strip. Oh, the border strip - that was cut using one of my punches that I haven't used in over two years. Ever since SVGs came along there doesn't seem to be a big need for punches anymore. I also used a label shape from The Pick Your Poison set. The little BEWARE sentiment is by the very sweet Alyssa of My Thoughts Exactly and the Host of this awesome blog hop! 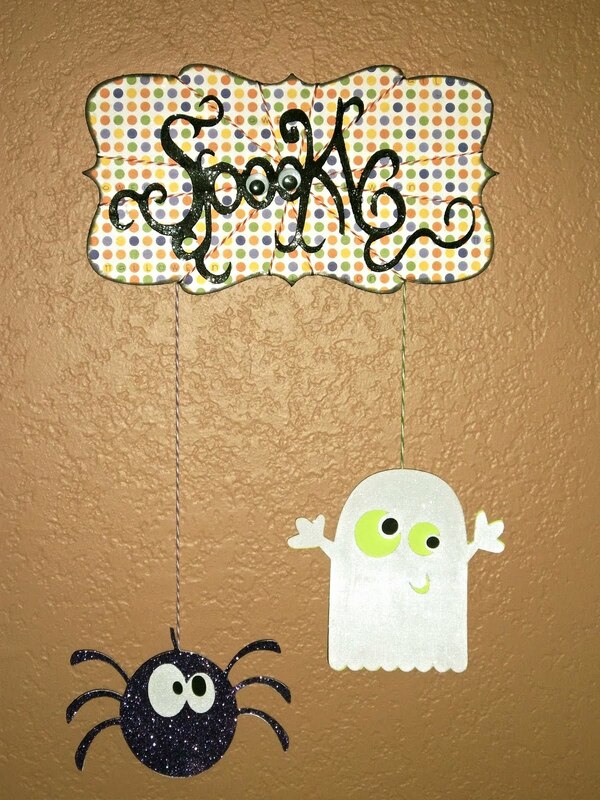 Finally for the finishing touch, I used Halloween Twine from Trendy Twine. 3. For a THIRD chance to win visit Trendy Twine on Facebook and tell her Cher sent you! 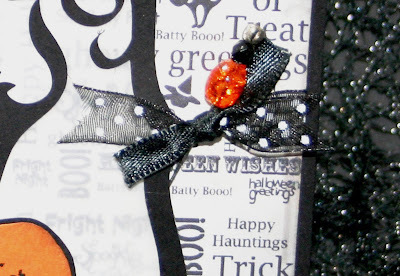 Remember you can triple your chance to win a $20 Gift Certificate and the halloween clear stamp set "Ghostly Greetings" from My Thoughts Exactly! Visit each blog for more prizes. I will announce my winner at the end of the week on Saturday morning. Be sure to stop by to see if you are a winner. Hey Scrapping Friends! 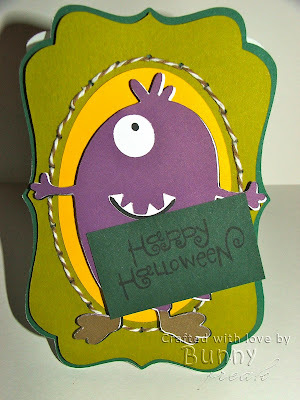 Welcome to Day two of the Fang-tastic Blog Hop. So here I am making a super, super late post for The Fang-tastic Blog Hop :( I have days where sometimes things just don't go as planned. This time I was delayed due to my laptop charger and battery dying on me. I had to make a dash to the Apple Store so they can replace my charger. By the time I made it home, I had to prepare dinner. Oh well, enough with my with my troubles. Better late than never, right? If you just got here from Bee (BeLinda’s Blog) then you are right on point! If not then head over to Alyssa’s blog at (My Thoughts Exactly) and start there! We are going to Hop the entire weekend so we dare you to be there, he he! 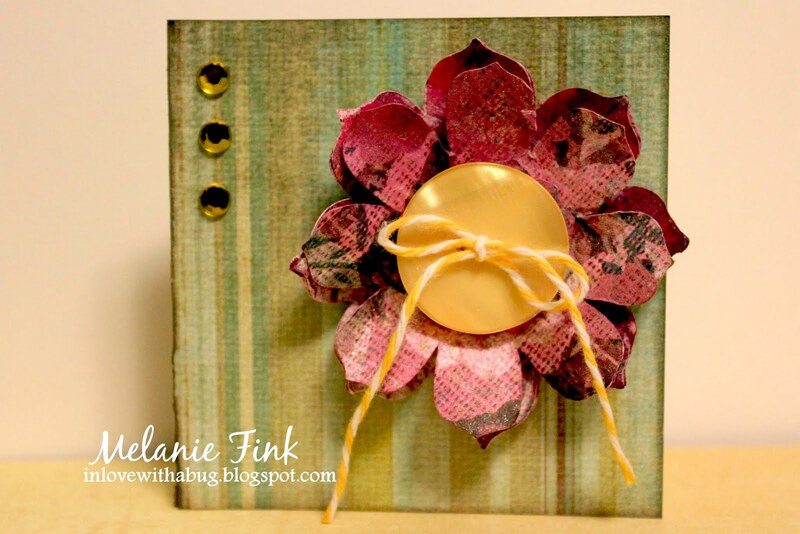 Want to know what I made for Day 2 of this fabulous blog hop? I created a simple 3 -fold card. 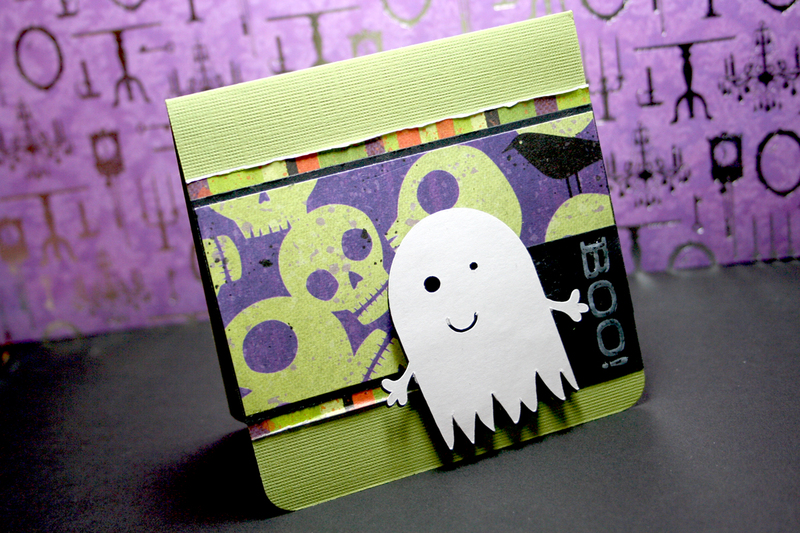 I used The Digi Bistro - Halloween Town SVG Collection to create a little spooky card you can use as a gift card holder. 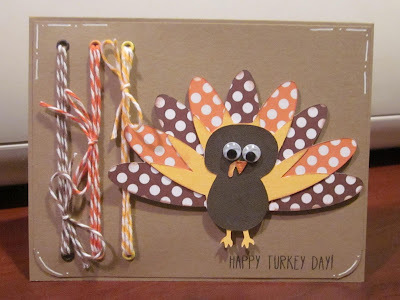 All you need to do is take a glue dot and place it on the back of the card and stick it in the middle section of the fold. 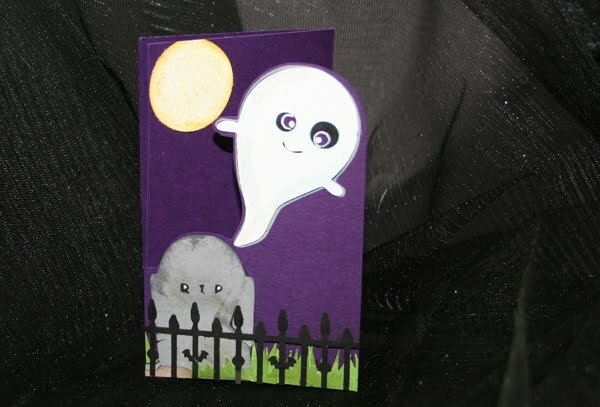 Here I show the front of the card with the little ghost over the stone. The fence is a Martha Stewart punch. This little guy was very quick and easy to make. 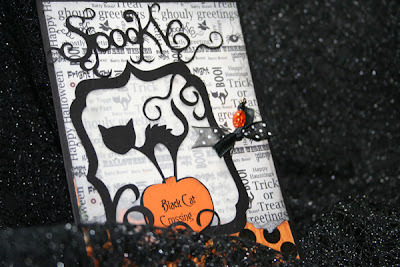 I used my Tim Holtz black soot around the R.I.P. stone and added glitter for highlights on the ghost! The sentiment is by My Thoughts Exactly. Don't forget to check out The Digi Bistro's This to That Challenge #8. Go HERE to link up for this week's challenge! 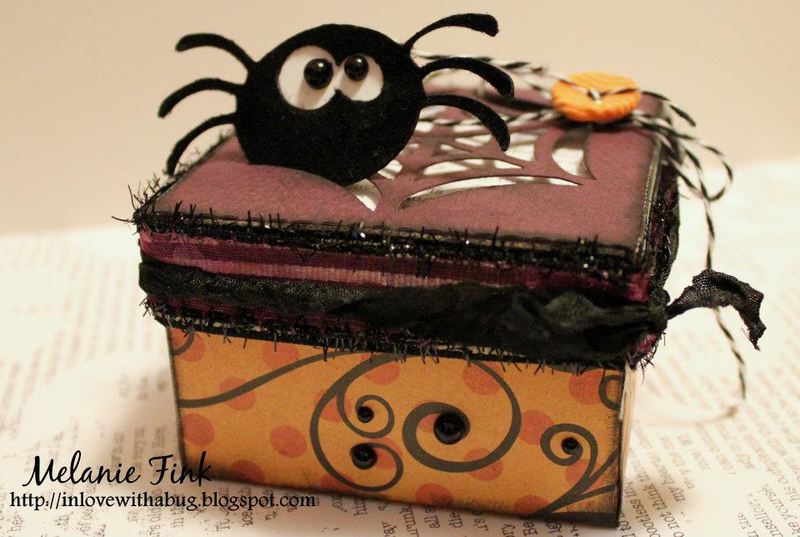 It's a Fang-tastic Halloween Blog Hop Day 1!!! Hi Crafty friends!!! 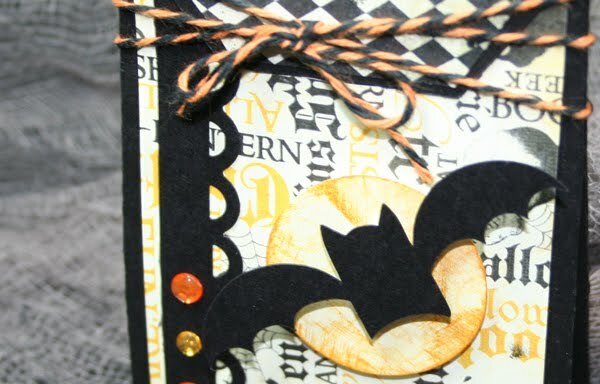 Welcome to a fabulous and Fang-tastic Halloween Blog Hop. If you just got here from Bee (BeLinda’s Blog) then you are right on point! If not then head over to Alyssa’s blog at (My Thoughts Exactly) and start there! We are going to Hop the entire weekend so we dare you to be there, he he! So on with the show! I made this spooky card inspired by K. Andrews’ Vintage Halloween card layout. I created the background paper from scratch and used the torn paper techniques to give the bottom a rough edge. A piece of vellum paper was used to highlight the frame and cat as my main display. I also created the orange paper and used the large Polka Dots clear stamps from Paper Trey Ink. Next I made and placed a cute little stickpin to push down into the silk and sheer bows. 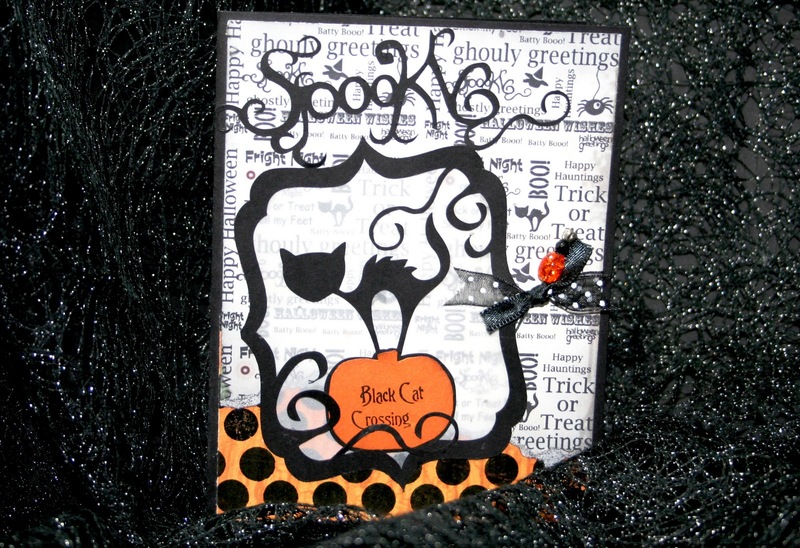 The frame, cat, pumpkin, and spooky sentiment are all from The Digi Bistro’s Halloween Town SVG Collection. 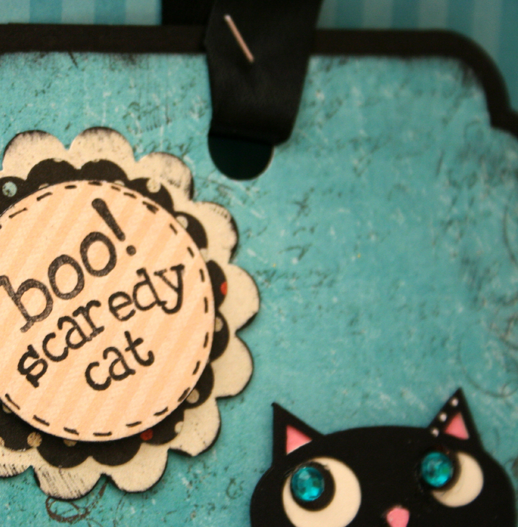 The ‘Black Cat Crossing’ stamp is from My Thoughts Exactly – Ghostly Greetings clear stamps. I have some great Blog Candy to give away! I have the Fright Night clear stamp set from My Thoughts Exactly to giveaway, along with a $20 Gift Certificate to The Digi Bistro store! 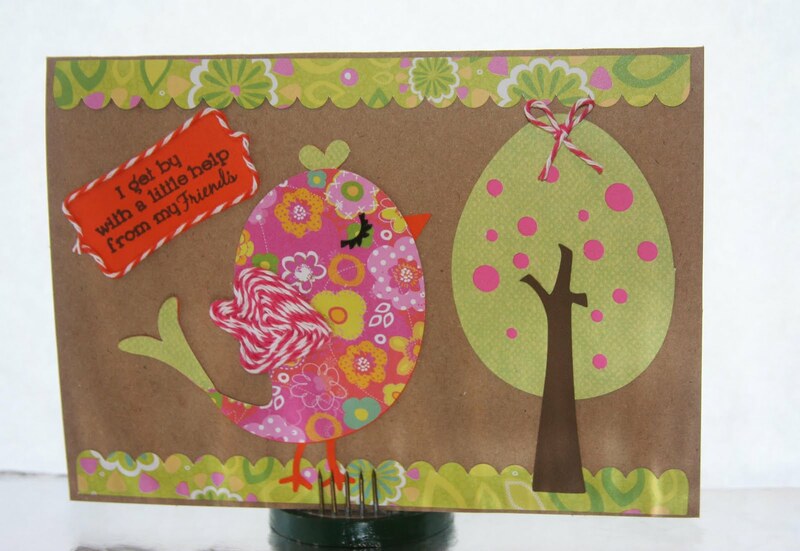 This will give you a chance to get your hands on some of our newest and cutest cutting files! You want to win, you say? Well all you need to do is become a follower here on my blog and then go over to The Digi Bistro facebook fanpage and like us! That's it! We have here over $40 in prizes. Remember, you must be in it to win it. Join me tomorrow for another day of super-fabulous projects from all the wonderful girls in the Fang-tastic Blog Hop! 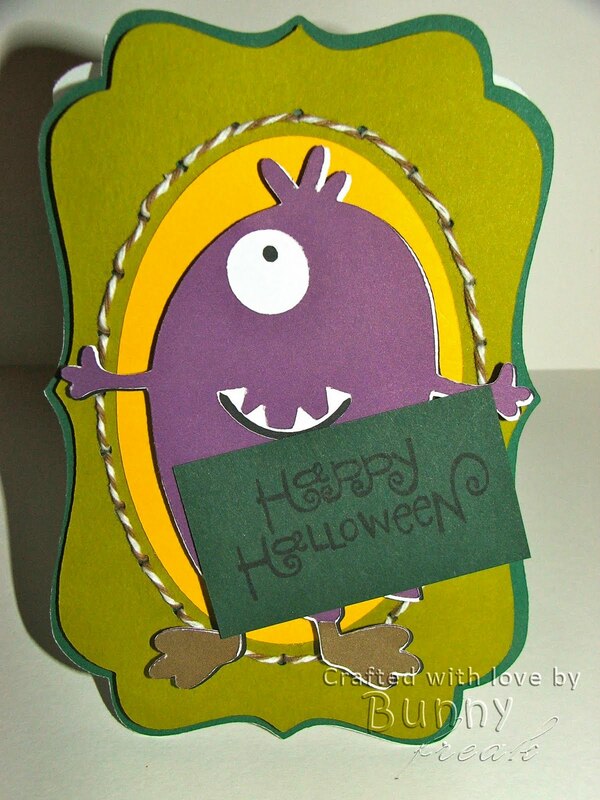 Now hop on over to Jennifer's blog for more Halloween Fun! Good morning everyone, this week’s ‘This to That Tuesday Challenge’ is in honor of Breast Cancer Awareness month and we want you to create a twisted easel card! Thanks to two of our Designers, Sandra and Suzanne, we are honoring Breast Cancer Awareness. 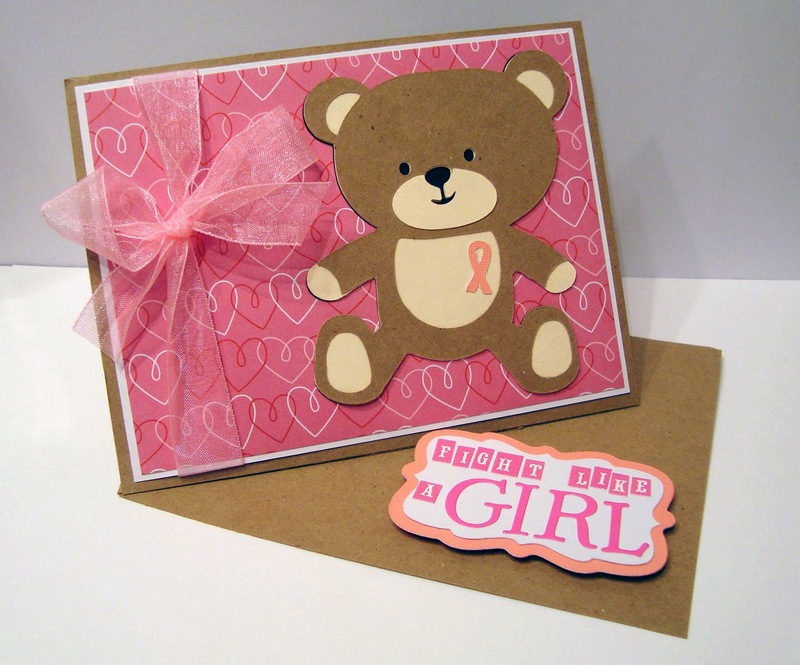 All this means is create a card, a twisted easel card that has the ribbon or any other Breast Cancer symbol on it. You can also use stamps, embellishments, or any cutting file you have on hand to support the cause. Link up your cards below on this post for your chance to win a $10 Gift Certificate to The Digi Bistro store! Don't have any SVG cutting files to support the cause? 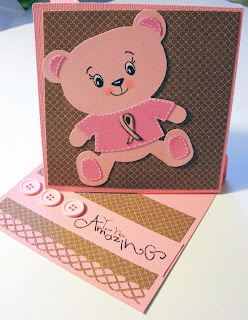 Do you love the cute little Teddy Bears in the cards by The Digi Bistro DT? Get these cute little bears over at The Digi Bistro for only $5.00. We will donate all proceeds to the Susan G. Komen foundation. Head over to our store and pick up your BREAST CANCER AWARENESS SVG COLLECTION today! 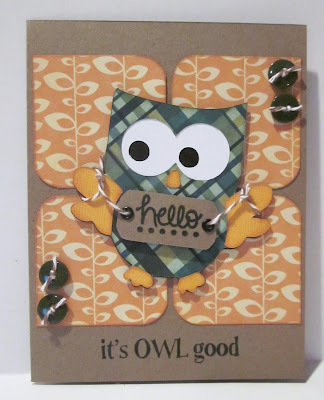 Don't forget to link up your card for a chance to win a $10 Gift Certificate to The Digi Bistro shop and make sure you head over to Suzanne's blog for a beautiful and inspirational video. Can't wait to see what you come up with. Happy Monday all! I've been missing in action a little here and many of you are probably wondering where's your prizes since the last two challenges. I have been so overwhelmed and dealing with some personal family matters. Then I got sick a week or two ago. 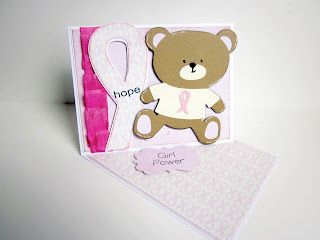 I am back and apologize for not posting the winner for our This to That Tuesday Challenge #6 held on Carley's blog! This is a very short post to let you know that I will be sending out prizes if you haven't received them already. We had five participants for Challenge #6. Using Random.org, our winner for TTT#6 is: Number 1: Sandi Pressley. Sandy congrats, you won The Digi Bistro Tag it Set and the Giggle Kids Clear Stamps by Making Memories! Please email me at cevans@thedigibistro.com to claim your prize!